Money-and all the worries that come with it-can easily consume your days. In certified accountant Deborah Smith Pegues's new book, she provides practical steps to real financial freedom. 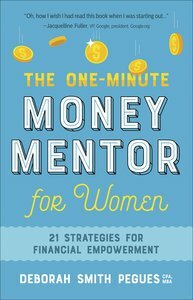 The One-Minute Money Mentor for Women will empower you to take charge of your money and conquer the bad habits, fears, and uncertainties that thwart your stability and success. About "The One-Minute Money Mentor For Women: 21 Strategies For Financial Empowerment"
Deborah Smith Pegues is an experienced certified public accountant who is also a Bible teacher, speaker, and certified behavioral consultant specializing in understanding personality temperaments. She and her husband, Darnell, have been married for more than 25 years and make their home in California.